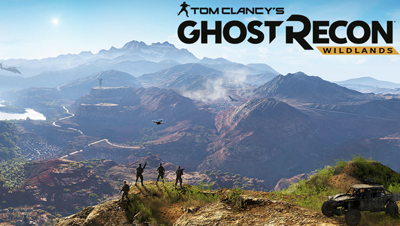 There is no denying that Ghost Recon: Wildlands is a large game, and no-one could be caught saying that they blitzed through the entire campaign in a matter of hours - but sometimes less is more, and Ubisoft definitely would have benefited from employing a little more restraint in building their representation of Bolivia. Getting things off on the wrong foot immediately, the plot is nothing to write home about, being a typical tale where American agency refuses to help under-privileged country fight against a regime of drug production, until one of their own is killed. After that, things devolve into one long quest for revenge -killing the head of the Santa Blanca Cartel, El Sueno. Interestingly enough, you don't just work your way through a linear list of missions, instead you have free reign to explore the titular Wildlands, whereby you discover scraps on Intel scattered around the map, which lead you to different Cartel targets. Each target is a thread of the Cartel spiders-web, and you have to work your way through each sub-boss, getting closer and closer to the head honcho. This is an interesting way to structure the gameplay, and certainly affords players an amount of freedom and choice of how they approach the game. The sad thing is that each area of the map, and each group of sub-bosses plays out in exactly the same way. The unique Intel-gathering quickly becomes repetitive and it becomes a chore to grind through each underling one by one before you can reach the bosses. Not only that, but in order to level up, you must gather resources - which entails repeatedly playing a group of side quests, over and over. Having a gigantic map to explore, with impressive environmental aesthetics, can only carry the title so far. Gunplay isn't particularly satisfying, and despite constantly being able to discover new weapons and modify them with parts, once you get a decent sniper rifle, there is no need to ever use another weapon in-game. Add to the mix a non-sticky cover system that never seems to work when you want it to, and there are a lot of drawbacks to Wildlands. The whole experience is saved somewhat by the fun to drive, arcade-like vehicle mechanics, and the persistent co-operative multiplayer that allows you and up to three friends to easily drop in and out of each others games. Whether you choose for a quick bit of stealth action, or to all pile into a tank and cause some destruction is up to you, but almost all the fun to be had in the game is that which you and your friends can drag out of it. If the game mechanics were placed in a shorter and more focused overall experience, Wildlands would be infinitely stronger. Any fun you do derive from the title is soon eroded by repetition however, as interesting gameplay ideas alone can't save this mission. CeX is coming to K-Con in Kerry! Check In to Win returns this Easter at CeX! Trade In Your Nintendo Switch In Store!